Dublin Airport, situated in the capital city of Dublin, is the gateway to the emerald rolling hills of Ireland. 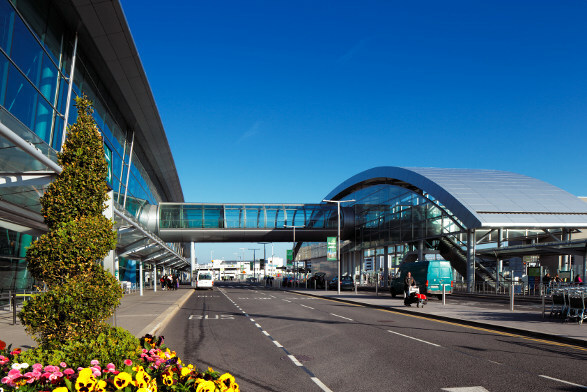 With the highest traffic levels on the island in the country, Dublin Airport exceeds Belfast International Airport. Dublin Airport has an extensive short and medium haul network, served by many various carriers. Dublin Airport (IATA code: DUB) is an international airport serving Dublin and the hub for Aer Lingus. Flights to Dublin Airport are provided by international airlines such as Emirates, Qatar Airways and Ethiopian Airlines. DUB is a 20-minute drive from the city centre of Dublin. Book your cheap flights to and from Dublin Airport online! Dublin Airport is your first stop in the beautiful capital city of Ireland. Dublin Airport officially opened on January 19, 1940. Initially, Dublin Airport only had one flight a day to Liverpool and Collinstown. By 1947, flights departing from Dublin had stretched as far as Continental Europe. Dublin Airport recorded its highest number of passengers, seeing 27.9 million passengers in 2016. Compare and book your cheap flights to Dublin Airport with Ryanair online at Travelstart! Dublin Airport has a variety of food and drink options available for all passing through the airport. Find incredible cuisine in restaurants, bars, fast food outlets, bakeries and restaurants in Terminal 1 and Terminal 2. Peruse amongst the amazing shops at Dublin Airport, including alcohol, clothing, sunglasses, perfume, books and gift shops. Dublin Airport has exquisite lounges located in Terminal 1 and Terminal 2. Passengers can book passes online or purchase at the airport. The airport lounges are available regardless of airline or class ticket. Dublin Airport has incredible facilities for your convenience, including banking, an information desk, medical services, a pharmacy, rest zones, showers and a children’s area. This 4-star hotel provides the essential rest and relaxation required for your Ireland escape. It is a 10-minute walk from Dublin Airport. Amenities include free Wi-Fi, self-parking, an airport shuttle, a restaurant and bar. Discover lavish accommodation during your stay at Radisson Blu Hotel. It is a 5-minute drive from the airport. Amenities include free Wi-Fi, free airport shuttle, self-parking, a restaurant and bar. This relaxing 4-star hotel is only a 4-minute drive from Dublin Airport. Amenities include a fitness centre, free Wi-Fi, breakfast, a restaurant and a rooftop terrace. Travellers can purchase their foreign exchange 60 days before departing South Africa. ICE (International Currency Exchange) outlets can be found in both terminal buildings of Dublin Airport. There are various parking options available at Dublin Airport, including short and long-term parking. Book your parking bay now! Dublin Airport is located 10 km north of Dublin’s city centre. Metered taxis, car hire, Uber and buses are available to transport you to your destination!